From time immemorial human beings have sought means to alter their consciousness. It is a natural consequence of: innate curiosity; a desire to escape pain, boredom, loneliness, stress, anxiety, fear, guilt or shame; pleasure seeking; a desire to enhance creativity and sensory perception; a quest for “enlightenment”; or a desire to stimulate social interaction—it is part of who we are as human beings. Lysander Spooner eloquently makes the point in his essay “Vices Are Not Crimes”, that it is an inalienable right of—and practical necessity for—every human being to study and know what actions will be conducive to happiness, and what to unhappiness. Since the inception of the War on Drugs, The State has stepped into this private personal space and arbitrarily criminalized the production, possession and consumption of certain substances, even if these actions are all taken by a single person in the privacy of their own home and without affecting any other human being. This criminalization harms society in general and increases the harms to the individual caused by their overconsumption (vice), or, what is now termed “substance use disorder”. When the British forced the Chinese to accept their opium, they laid the template for State actors to control the production and distribution of certain substances for political and economic ends. This history has been thoroughly documented in works such as: The Politics of Heroin in Southeast Asia, by Alfred McCoy; The Strength of the Wolf and The Strength of the Pack by Douglas Valentine; and “The Harmful Side Effects of Drug Prohibition” by Randy E. Barnett, which, as the title suggests, is where the rubber hits the road. I have been critical of both the Milwaukee City-County Heroin, Opioid and Cocaine Task Force and the Office of Violence Prevention’s Blueprint for Peace for failing to even mention the War on Drugs and the myriad ways it is traumatizing our community. The harmful effects of drug prohibition have accrued over three generations here in Milwaukee since it was ramped up by Richard Nixon, who intentionally targeted minority populations and the anti-war movement. The cumulative damage may take generations to heal and we should start the process by ending the War on Drugs—ALL DRUGS. • There were 13 (15.1%) drug-related homicides in 2014, 25 (17.2%) in 2015, and 15 (10.8%) in 2016. • There were 60 (10.3%) drug-related shootings in 2014, 68 (10.7%) in 2015, and 36 (6.4) in 2016. 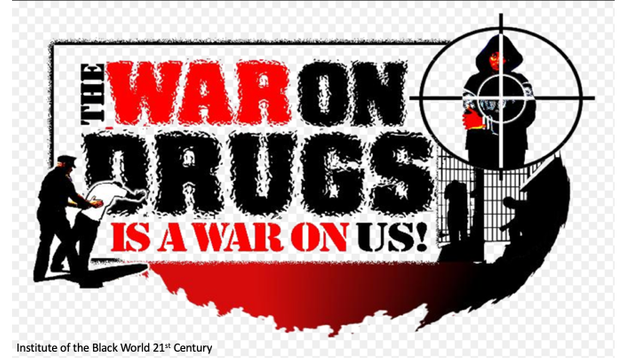 • I think it is fair to assume that, a percentage of the argument related, gang-related, retaliation, and unknown cause, homicides and shootings are also connected to drug prohibition. What is the impact of all this trauma inducing violence on the survivors, friends, family and witnesses? • Undoubtedly, much of the other crime and violence in Milwaukee is related to drug deals gone bad or attempts to get money to buy drugs. Consider the car thefts and reckless driving that often accompanies mobile drug markets. • A significant percentage of the time and resources of the Milwaukee Police Department is spent enforcing the drug laws or responding to the violence and crime that accompanies drug prohibition. • The War on Drugs has led directly to the introduction of fentanyl into the illicit drug supply and it now accounts for over 50% of the opioid overdoses. • Pregnant women who are using controlled substances do not get the medical care they need prior to and after giving birth because of fear of losing their child and being incarcerated. This results in a higher rate of infant mortality, especially among black and brown babies. • People who cannot get a safe dose of the substance they need to “get well” from a legally regulated market are exploited by human traffickers. • The choice to inject drugs is driven largely by the consumer’s desire to maximize the return on their risky acquisitions and this leads to HIV, Hepatitis C and many other harmful effects. And again, people of color are the most impacted. • People being incarcerated for drug crimes may result in family members being evicted or foreclosed on. • Incarceration breaks up marriages and families. • Even a short time in jail can cause a person to lose their job, possessions and housing. • Ex-felons have the odds stack against them in a myriad of ways especially in the areas of employment and housing. • Drug laws have been disproportionately enforced on people of color for 3 Generations now. Does this foster respect for the law? What is the cost of trust lost? • The “Broken Windows” strategy of policing, which is a weapon in the War on Drugs, has resulted here in the ACLU Stop and Frisk lawsuit. This has not only cost the city millions of dollars, it has eroded the trust between the people and the police. • The hypocrisy of criminally stigmatizing people who self-medicate with arbitrarily controlled substances, while we are awash in prescription drugs, alcohol and tobacco (that kill far more people), deadens the conscience and erases the distinction between right and wrong. We must recognize the harms that drug prohibition causes and acknowledge that there is no quick fix for a problem that has festered for three generations. Sadly the media and politicians have thoroughly indoctrinated people into thinking drugs=bad. The truth is this a war on native medicines, sponsored by corrupt government and big pharma. The truth is the war on drugs has made the situation worse. The crackdown on opium/heroin gave us fentanyl 80 times more potent than heroin. The crackdown on cocaine brought us the meth epidemic. Cannabis prohibition has tragically impacted mostly minority communities. Sadly it is still politically expedient to be tough on drugs, completely ignoring aspects of personal liberty and individual freedom. Some honest education about addiction and dangers of misuse are missing. Ending federal government cannabis prohibition would be an excellent first step. It's happening slowly. But sadly in places like California the government wants too much control and a black market still thrives. Essentially government is the problem. With individual liberty and personal freedom comes responsibility. People are far too eager to hand that responsibility to government. The other aspect is any government controls over native medicine is flat out immoral and contrary to nature. You are quite right there is no quick fix, except the reduction of government controls. Once the corporate controlled media quit their anti native medicine propaganda. It will take some doing to reeducated people about native medicines.